NEW YORK CITY!!! The city that never sleeps. What is there not to love about this place? I mean if I could drop everything here in Atlanta and move to NYC I would be there in an heartbeat. But because I can't do that just yet, I will just settle for visiting there every year and read about all the happenings that is going on there. A few weeks ago I was visiting my niece and decided to stop by the Marshall's in her area just to browse and to see if something woud catch my eye and possibly purchase. As I strolled through the store I headedto the area where Marshall's stock their pictures. As I strolled I saw a picture that caught my eye, it was a New York City picture with all my favorite areas in or around the city. Now I've been looking and have been seeing pictures just like this but felt it wasn't the price I wanted to pay at the time (yes, I try to keep a budget) but this time around Marshall's had my picture and for the right price. 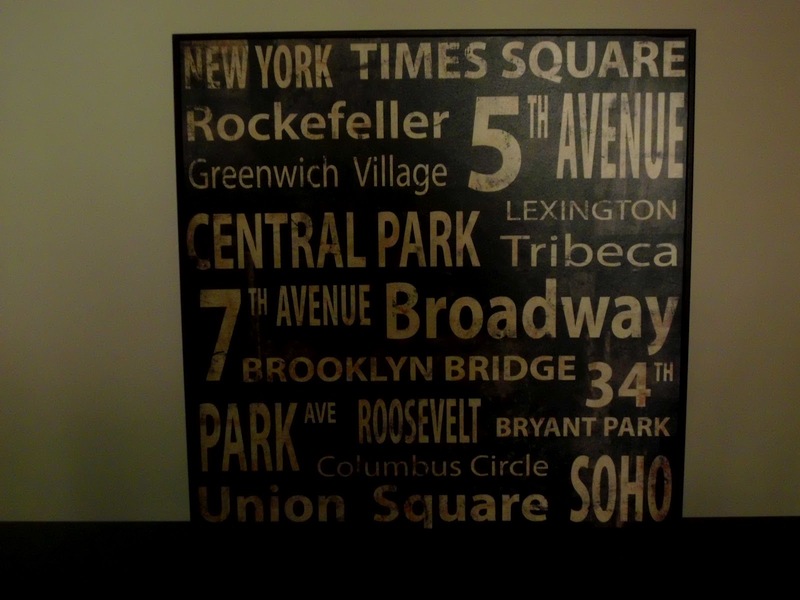 If I can't move to New York just yet, I can at least bring New York and some of my favorite areas into my Atlanta home. Do you have a favorite city that you just can't get enough of? What do you think of my frugal find?